Serge Gainsbourg & Jean-Claude Vannier - Les Chemins De Katmandou. Vinyl LP. Bleep. 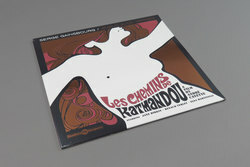 After decades in the making Finders Keepers Records are proud to present the first-ever pressing of Serge Gainsbourg’s most elusive and coveted soundtrack studio recordings - co-written, arranged and orchestrated by the genius Jean-Claude Vannier (‘Histoire De Melody Nelson’) during what many consider to be the dynamic duo’s most definitive creative period.